FORWARD Ep. 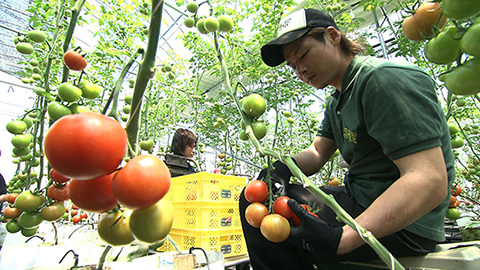 31 Cultivating a Recovery | jibtv.com | Japan International Broadcasting Inc.
Sendai Tomato Farm is a plastic greenhouse farm in the city of Sendai, Miyagi prefecture. A restaurant chain company built the farm as a contribution to the recovery of the area after being severely damaged by the tsunami of last year in 2011. 11 young local farmers are now working at the farm and will train to acquire a new tomato cultivation technique. The program follows their passion in growing tomatoes and their commitment to recovery and progress.